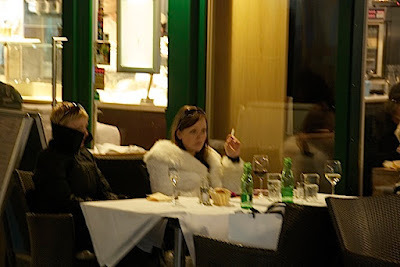 It's so cold in Vienna you have to wear your coats indoors when dining! So seductive and alluring. Many thanks. That coat, that face, that cigarette: so evocative! Your Nighthawks photo has such presence. It's an image to launch a long story. THat's a wonderful shot - right out of a film. Tells a whole story in a frame. Love that shot. Like a movie scene! Just as MT said - it does in fact look like a still from a movie. Great shot.